As there will be many MoMo’ers in Barcelona next week, we are pleased to pass along this info to our network that the Mobile Monday founders and organizers, from over 15 global chapters in operation today, will meet at the Finnish stand — Entre marketing at Hall 1 section/stand C59 — on Monday 13 February between 13:00 and 15:00. 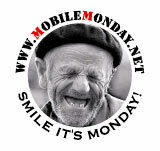 They will also be handing out “Smile it’s Monday” buttons and infocards for this years MoMo Global Summit as well. Look forward see many from Tokyo there!